The Swiss Alps are popular for a lot of reasons, but what about a do-it-yourself modern-day detox? High up in their hills is a network of old villages that harken to the past—tiny communities that move at a slower pace, foster personal relationships (even going so far as to chat up strangers), and—perhaps best of all—are devoid of cars. To reach these beatific destinations, you’ll need to rely upon your feet, funiculars, and cable cars. Once there, soak in the romantic and peaceful solitude that comes with a life free from traffic and blaring horns. If you’re ready to pack your bags, we’ve got the scoop on six of our favorite spots. Braunwald is a well-kept Swiss secret. Unlike the car-free villages of the Bernese Oberland and areas surrounding Luzern and the Valais, this tiny village of less than 400 year-round residents is off the beaten track. Located in the canton, or county, of Glarus in eastern Switzerland, Braunwald has magnificent, panoramic views of the Glarus Alps. In the winter, ski slopes are practically at your doorstep. Summertime means ridge hikes or longer walks that can take you to Schwyz or Uri—and then back by a local postal bus. The village has little more than a bakery, cafe, small grocery store, a few restaurants (in hotels), and an ATM. One of the best places to stay in Braunwald is the luxurious Ahorn, but there are a slew of family-run establishments nearby, too. Braunwald is a little more than two hours by train from Zurich, and for the final leg of the trip, you take a long funicular through a forest at a nearly forty-five degree angle up the mountain. It’s a magical journey, from start to finish. Just above the Lauterbrunnen valley, which inspired Tolkien’s landscape descriptions inThe Lord of the Rings, this village in the Bernese Oberland has astonishing views of three of the most famous mountains in the world: Eiger, Monch, and Jungfrau. The hiking is world-class, too, and the slopes are so good that some say that the English invented skiing here. There’s a supermarket, bakery, butcher shop, and a few cafes, restaurants, and hotels in town. But the local haunt not to miss is Stägerstübli, which has tables outside where you can hear local gossip as you sip your beer. Müerren is reachable by a cable car and then a mountain train. This is the easiest mountain village to reach of the lot. Made famous by Mark Twain (the town honors him with a namesake trail), Rigi is reachable by train from Weggis, which is on Lake Luzern. After you arrive at the mountain, you can slink away from the crowds and enjoy amazing views of central Switzerland in all directions. Either make it a day trip from Luzern—by boat and then train—or spend the night. TheHotel Rigi Kaltbad has world-famous mineral baths and a spa. Inside an ancient rock formation that resembles a bowl that has been scooped out of the earth, Saas-Fee is a ski village nonpareil. 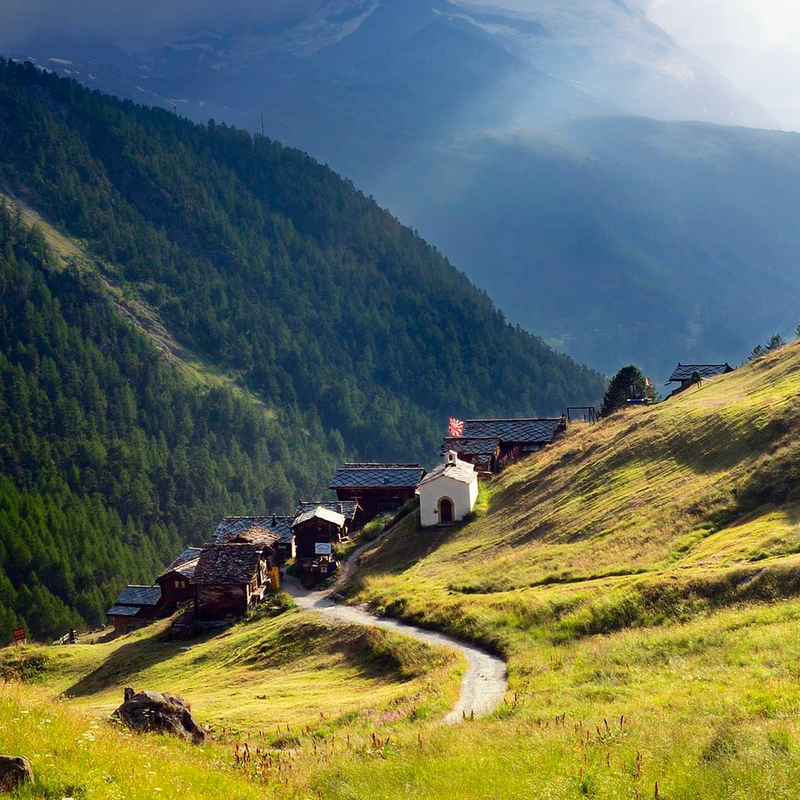 While the old charm has been diminished somewhat by all of the visitors in recent years, the landscape around Saas-Fee remains untouched and ideal for long walks in view of thirteen mountains that are all well above 12,000 feet high. Long renowned as a wellness destination, you have your pick of places to go and things to do, though we’re partial to the spa at the Ferienart. For a memorable meal, don’t miss theworld’s highest revolving restaurant. Across the Lauterbrunnen valley from Müerren, this small, posh village has access to some of the best long skiing imaginable. Wengen is a little more developed than the other villages, because it’s on the train route that takes tourists from Lauterbrunnen up to Kleine Scheidegg, and then on to the Jungfrau. In the summer, thousands—on average five thousand a day, in fact—scale the peak and stop here to look around. Wengen offers more excitement and activities than most of the other villages, and is perfect if you’re looking for a storybook Swiss holiday: magnificent walks in view of a few of the country’s picturesque mountains, and opportunities to hike all the way to Grindelwald and beyond. Zermatt has been a coveted Swiss destination for years, and it’s no wonder why: with a long and narrow walking street, views of the Matterhorn, first-rate skiing and hiking, it retains its Old World charm but also has a chic, international edge, complete with posh stores and upscale dining. For a true get-away-from-it-all experience, book a room at the Riffelalp Resort 2222m, a classic Alpine hotel that overlooks the valley. While you’re there, walk the Riffelsee Trail, or ride the Gornergrat, a funicular that takes you to more than 9,000 feet; we suggest you ride up then walk down.